The schedule for the day was very rich. 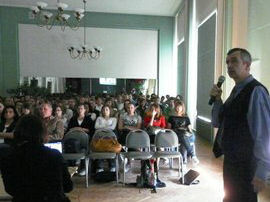 It began in the basement of the building, in the arranged Oświęcim Room shown to guests by the guide- Mr Paweł Stanieczek, the witness to Golleschau camp’s activity in 1942-1945. 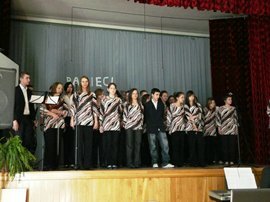 Students performed a Jewish song “Hawa nagila hawa”, played Jewish music themes. Guests could also hear a touching poem about Herszek who smuggled food into the ghetto from the Aryan side. 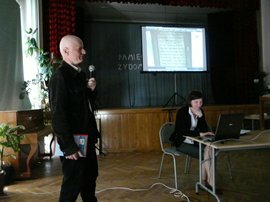 Afterwards, Zbigniew Niziński carried out a presentation concerning Jewish cemeteries and people who survived the Holocaust as well as those who rescued them from extermination. The speaker encouraged students to commemorate the brave acts and dramas which took place during the war and now are gradually falling into oblivion. After a short break Mrs Agnieszka Kocur (a graduate of Jewish Studies at Jagiellonian University and a guide in Auschwitz-Birkenau museum) delivered a lecture titled “Only a trace remained…” The speaker outlined the situation of Jewish community in Śląsk Cieszyński over the centuries. She encouraged youth to discuss polish stereotypes of Jews on the example of Janusz Korczak’s photographs. At the end of the day Daniel Starzyński briefly discussed the story of Hebrew language. He pointed out the father of contemporary Hebrew literature- Szmuel Josef Agnon who lived in Israel but enjoyed writing about the country of his childhood- Poland. 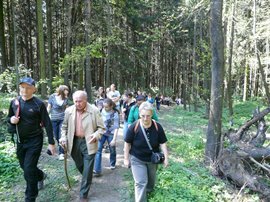 Afterwards, guests set off along the old, daily route of Goleschau subcamp prisoners. The road climbed up towards Jesieniowa Góra at the bottom of which, in quarries, had worked the exhausted prisoners.